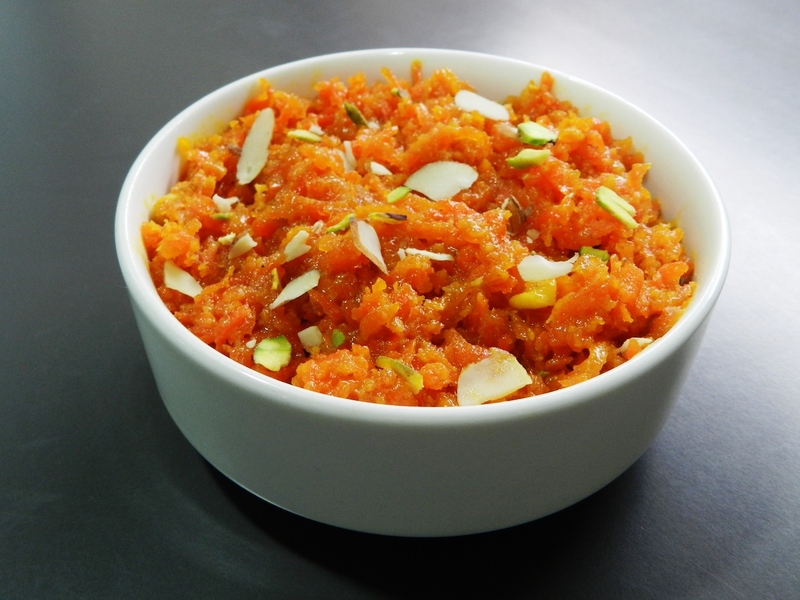 Gajar halwa is a much loved dessert in India. This traditional sweet is made with tender carrots, slow cooked with milk. Once the carrots have soaked up the milk, you’ll mix in some sugar, ghee and sweet cardamom spice. Throw in some juicy raisins. Garnish with slivered almonds and pistachios. Now you have a rich, creamy winter delicacy that can be served for special occasions (like weddings), or just because you’re craving something yummy that just happens to also be kind of good for you. Rinse, peel and grate the carrots. Press down on the green cardamom pods with the flat edge of a kitchen knife to crack them open. Remove the seeds and add them to a mortar and pestle. Discard the pod shells. Grind the cardamom seeds into a fine powder. Set spice aside for later. Soak the almonds and pistachios in hot water for 8 – 10 minutes. Drain the nuts and peel the skin. If you squeeze the fat end of your almonds, they should pop easily out of their skins. Dry the pistachios by vigorously rubbing them in a paper towel and then use your fingers to peel off the skin. Split the nuts with your fingers and then use a sharp knife to cut them into slivers. Set aside for your garnish. In a thick-bottomed pan, mix the carrots and the milk. Bring the mixture to a boil over a medium flame. Keep stirring while the pot comes up to a boil. Once the mixture is boiling, reduce your heat to low. Simmer until the mixture thickens and the carrots absorb most of the milk. Depending on how much water your carrots contain, and the heat of your stove, this could take 20 – 30 minutes. While the carrot cooks and the milk evaporates and reduces, keep stirring. Scrape the sides to remove any evaporated milk solids. Add these solids back to the main mixture. Stir and continue cooking for another 5 – 10 minutes, or until the carrots have absorbed all of the milk and ghee. When the consistency is that of pudding, mix in the cashews, pistachios and raisins. Stir to combine. Continue to cook over low until all of the moisture has evaporated from the mixture. Serve your gajar halwa warm. Note: make this dish vegan by using coconut milk in place of milk and substituting vegan butter for ghee.